The Jewelry Expo ends on Saturday so do not forget to stop by and grab your $1L gifts. I have 2 bags at my booth. The first is a Fire Agate Magic Necklace with magical beads. The second contains 2 pairs of Halloween shoes, colorful gemstone skins, and a necklace. 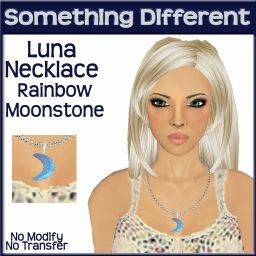 The 2 new releases at the Expo are the Luna Necklace and the Mazu set. My booth is located HERE. The Luna Necklace comes in 16 different gemstones to choose from at only $25L per stone. The Mazu Set(necklace, earrings, bracelet) comes in 6 different gemstones to choose from at only $50L per stone.